Perrier is a sparkling water brand that was one of the fore-runners of flavored bottled water. Perrier has been in business more than 100 years and still enjoys being one of the best-selling water brands on the market. The company was started in 1863 and has flourished since then, branching out from simple waters to sparkling flavored waters that sell just as well. Consumers can choose from many different sparkling favors, such as grapefruit, lemon and lime, as well as detox blends full of antioxidants. 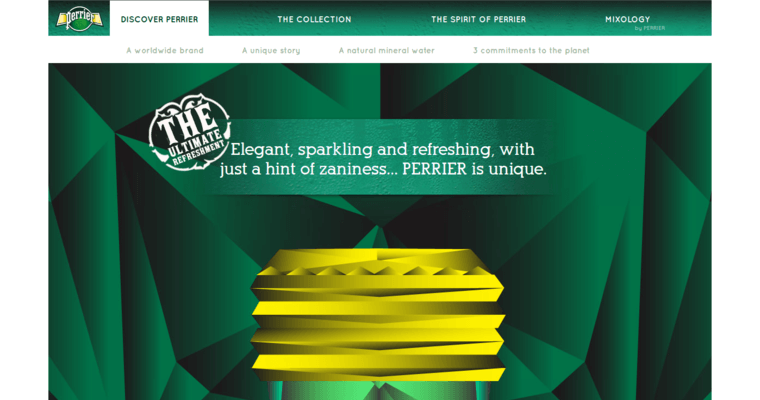 Not only that, Perrier now offers new bottle designs to fit the needs of a busy market. Buyers can choose from glass bottles, which are convenient in the home, to plastic bottles that are best for on-the-go. Perrier also comes in slim cans that fit easily in lunch boxes, purses and gym bags. For a beverage that hits the spot, Perrier will never go out of style.